A week ago Dan and I met up in Lyons early one morning and made the drive up to Wild Basin. We were going to try for Finch and Pear Lakes, something that I had set out to go for on my first ever snowshoe adventure last year. At that time, I made it to the forest fire area, where I met with deep powder and lots of down trees. Eventually I turned back, so I wanted to return this year. We started from the Allenspark Trailhead this time, and it was quite pleasant. This way will take about one mile each way off the journey to either, making it four miles to Finch Lake and six to Pear. It also starts about 500 feet higher, so there is less total elevation gain. Snow conditions were good- well packed trail with just a dusting of powder. We both set out in our snowshoes, though in reality they were probably not needed until after Finch Lake. Not much in the way of views to start, but this changes once you meet the Pear Lake trail and can see north. Pictured above- Pagoda Mountain, Longs Peak, and Mount Meeker. Dragons Egg Rock visible on Meeker. Finch Lake was relatively easy to get to since the trail was already broken. A far cry from last year! About the most snow either of us had seen in the mountains this winter. We also found ourselves fortunate that someone or someones had been from Finch to Pear Lake already, and the trail was relatively broken in. I'd still take snowshoes for these two miles though. Elk Tooth and Copeland Mountain from Finch Lake. Elk Tooth from Finch Lake. I have very fond memories of climbing it last year. St. Vrain Mountain as seen from Finch Lake. This peak actually lies on the same ridge as Elk Tooth and Ogalalla. Click here for a similar view as seen in the summer. There wasn't much to see until we got to Pear Lake. The light winds we had encountered at the lower elevations were ripping here, and we didn't stay long. This is the sign that you go around to head to Hutcheson and Cony Lakes. Buried. Elk Tooth looking ever more impressive as we get closer to it. Elk Tooth and Copeland looking over Pear Lake. Click here for a similar view shot in the summer. Copeland in the winter. Click here to see it in the summer. Great views at Pear Lake. A bit chilly in the wind, but loving it. After not being able to make it to the lake last winter, it was a great feeling to have success this time. We followed our prints back down and had a wind sheltered snack before heading back. We both stopped in the forest fire area to remove our snow shoes. Wild Basin, my home away from home. I can of course only speak for myself here, but I had a great time doing this hike. I have been to these lakes plenty of times in the past, and I will definitely visit them again in the future. 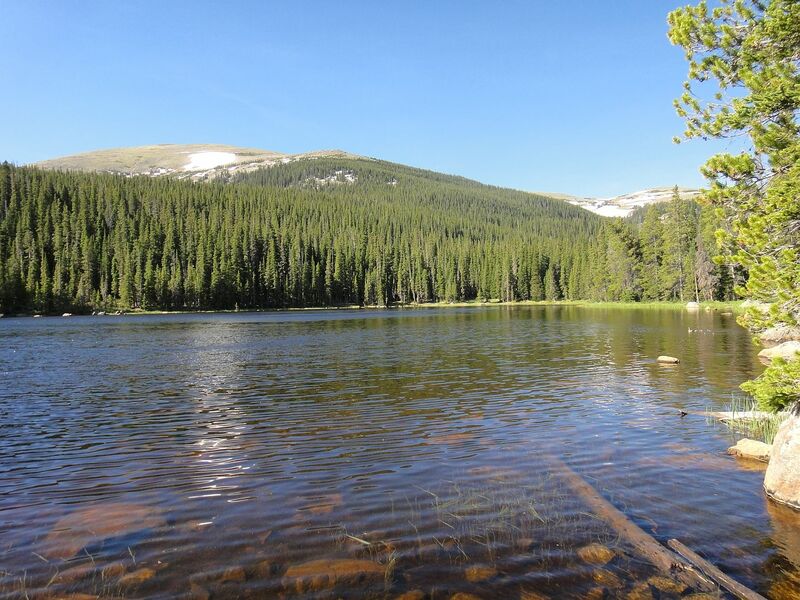 In fact, some of my fondest RMNP memories thus far are from this drainage. If the trail is broken for you as it was for us, it should remain not that much more difficult than it is in the summer. This is truly a wondrous place, and somewhere awesome and awe inspiring to visit any time of the year. Finch Lake: 4 miles one way, 977 foot gain. Moderate. 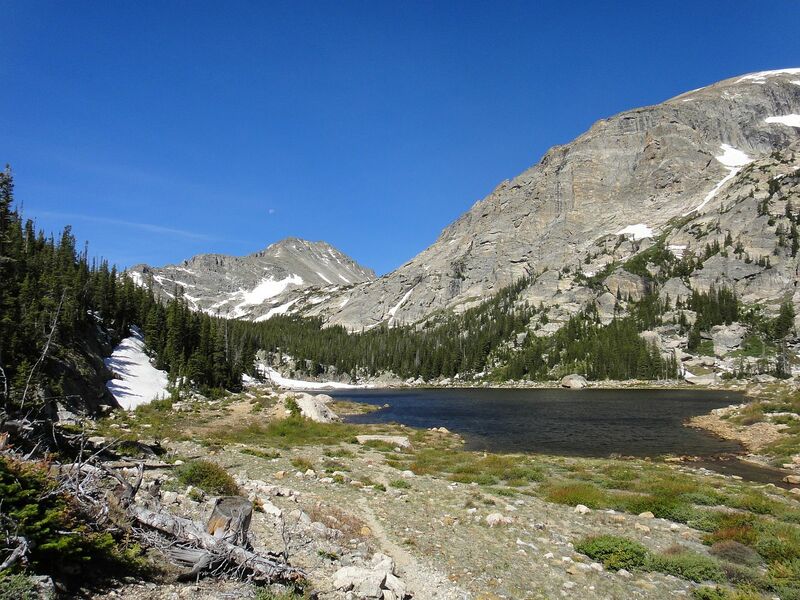 Pear Lake: 6 miles one way, 1647 foot gain. Moderate +.